Konishi Hirosada (ca 1810 - 1864) Ichikawa Ebizo V as the Warrior Akushichibyoe Kagekiyo from Tales of Loyalty, Bravery and Filial Devotion, 1848. Deluxe Chuban. This is one of Hirosada’s finest designs, an outstanding essay in design, draftsmanship and colouring. This image is as beguiling and mysterious as it is skilled, really a masterpiece of ukiyo-e design. The colour scheme of delicate browns and blues twists and turns through subtle overprints on the hat and shaded bokashi and intricate pattern. 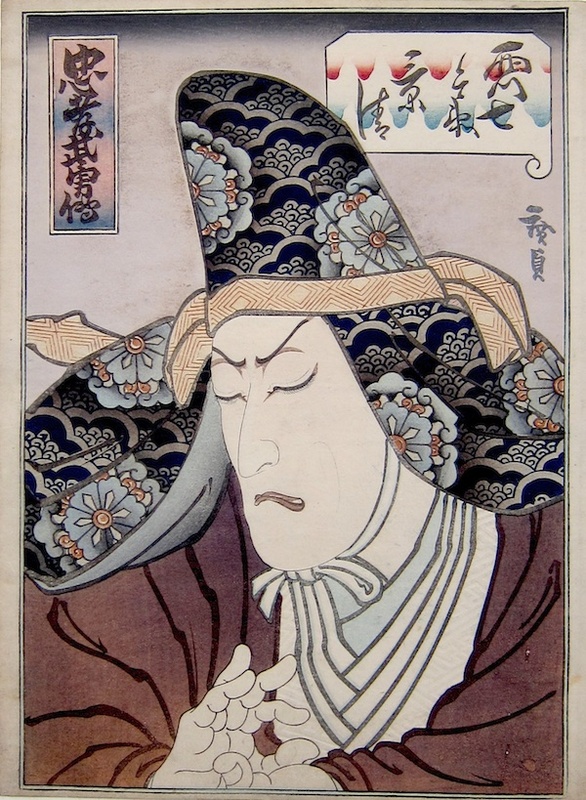 The portrait; eyes closed in painful meditation (so unusual for a kabuki portrait); the fingers caught in a refined and complex graphic play at the bottom, is as great as anything equivalent in the same period anywhere in Japan. Hirosada has achieved here a complete art, in total harmony - a balance of colour and gesture, observation and intimacy that represents a completely coherent artistic vision. We see the warrior Kagekiyo seeking revenge against the powerful warlord Yoritomo. 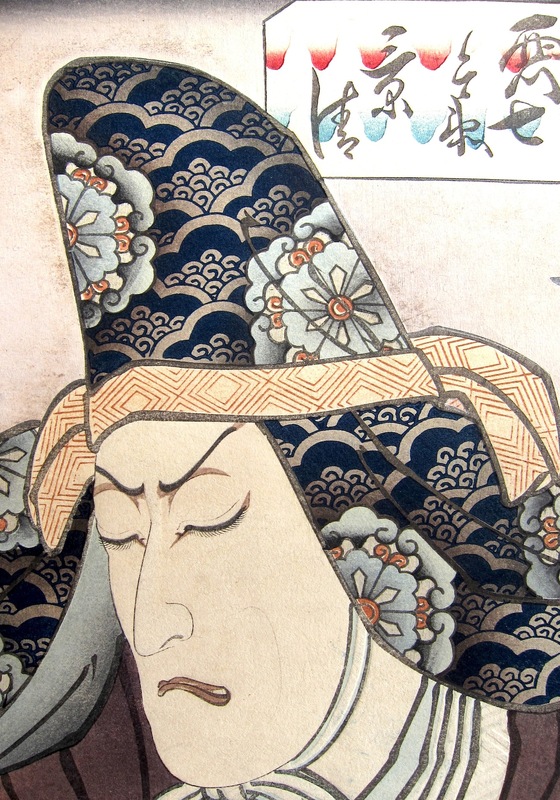 Intending to assassinate him at a temple in Nara, Kagekiyo dresses as a priest. He is discovered and challenged to fight but refusing to acknowledge his captors, he closes his eyes and continues to pray. Yoritomo spares him execution but blinds him instead and exiles him to a remote island. HIrosada pictures Ebizo as Kagekiyo in his priest’s garb, praying with closed eyes. The picture somehow predicts the dreadful fate that awaits the subject. The importance Hirosada gives to the eyes is unusual. The intimacy of the drawing shows not only the elaborate make up required of the role but also the actual eyebrows of the actor, something highly unusual. There are two versions of this print. The early deluxe version (very rare), and the second edition which lacks the elaborate printing to the hat and the multi coloured cartouche. This copy is from the first deluxe edition, printed on thick paper with fine embossing to the robes and the intricate printing to the hat. This is a very fine print indeed in near perfect condition, full size, perfect impression, delicate colours and deluxe techniques. Very fine throughout. The preliminary drawing for this print is in the Philadelphia Museum of Art. The print is featured on page 34 and discussed in full on page 82 of Keyes, Hirosada: Osaka Printmaker, 1984.